What surface finishing do you provide on your pliers ? 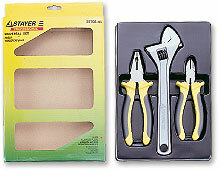 What packing types do you provide on the pliers you make ? What handle types do you provide on your pliers ? What jaw style do you provide on your pliers ? What cutting style do you provide on your pliers ? What is the cutting edge hardness for your pliers ? What details of cutting results of your cutting pliers ? New question to be answered ? Please click here to contact us. We provide the following packing types for your reference. We provide the following handle types for your reference. We provide the following jaw styles for our pliers. We provide the following cutting styles for our pliers. Please check with the following table. The cutting edge hardness for our water pump pliers is 38 to 42 HRc, circlip pliers is 40 to 44 HRc and the other pliers is 58 to 62 HRc.